Tag Archive | "Joseph Shumpeter"
Sunrise, walking through deep woods, about 50 miles from nowhere in the Wilderness of Canada. I was heading toward Moose Lake in North British Columbia and surrounded by deep woods, spruce, lodge pole pine, swamps, bogs, shimmering yellow poplar and pristine lakes. Here, in the deep wilderness, day after day, I hiked many miles with no one just me, the moose, wolves, bald eagles and my thoughts. 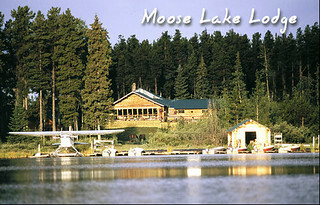 Moose Lake lodge… one of Merri’s and my favorite wilderness destinations. These northern reaches of Canada are places of deep silence that evoke a lot of thoughts. One morning while riding a horse many miles from the lodge my mind wandered and soon I realized I was more than lost in thought. I was lost in the woods! As the eve fell I knew I was in a grave situation. I had made most of the stupid amateur mistakes any woodsman can make, wandering for hours off the trail leaving my horse, coat, compass and matches miles away. Every protection was left behind! Thinking about investing and the beauty of the woods instead of location suddenly found me bordered by deep woods and swamp, miles from anywhere or anyone and not knowing how to get back. What should I do… stay put, plow ahead or try to retrace my tracks? The forest had nasty quirks. There were grizzlies and just that morning the valley had erupted in mournful cries from a pack of wolves. I had a gun but only three bullets. Would shots attract my hunting partner who was miles away? Would he hear? The wind had risen. The weather was turning cold. There was a chance my shots would not be heard. Should I shoot to attract attention or save the bullets for protection during a night alone in the woods? I decided to use the bullets to attract attention…I shot all 3 of them. It worked! My guide appeared and I slept in a soft bed that night instead of tied high up in a pine tree listening for those wolves! That era reminded me of a lesson which is to always be aware, wary and careful. This incident can be used to help answer a question so many readers sent after the recent article about North Korean hacking being WWIV. New readers often miss several basic foundations of the mindset we use at this site. One foundation is the importance of conflict in the cyclical pattern that flows through the basic fundamentals of human nature. These cycles have resulted in a series of industrial revolutions that have been directing stock markets, global economics and the world’s political and social interaction for over 1000 years. An excerpt from the update of my report “Running Risk – How to Profit in Risky Times” may help clarifiy what I mean by WWIV and its importance to each of us in life, business and investing. The cyclic suggestion in that article entitled WWIV is that there are struggles that create new disruptive technology. Austrian economist Joseph Shumpeter wrote about this and it is a pretty accepted line of economics that disruption derived from war enhances productivity when it is moved from the military to the domestic realm. To grasp this dilemma, let’s think about the history of modern society. Several hundred years ago Europe was dominated by a feudal political system. The economy was powered by agriculture based on manpower and domesticated livestock. The limiting velocity of man, of his thoughts, ideas and commerce was the speed of a horse. Fate, current and wind ruled marine travel. Then in desperation over manpower shortages caused by a series of plagues, humanity took an economic evolutionary turn. We made a giant step forward with new ideas about mechanical power. These ideas gave rise to incredible inventions such as the steam engine and telegraph. We have moved thru seven industrial eras. The first era was feudal dominated by the stirrup and the Holy Roman Empire. Era #1: 1785-1845-fueled by water power-60 years. Textiles and iron works were the backbone of growth industries. Era #2: 1845-1900-fueled by steam-55 years. Railways and steel provided the main growth in this era. Era #3: 1900-1950-fueled by the internal engine-50 years. Electricity and chemicals provided the major growth. Era #4: 1950-1990-fueled by electronics-40 years. Petrochemicals and aviation were the innovations which became mainstream in this period. Era #5: 1990-current-fueled by digital networks- 30 years+ ? Software and new media create the growth elements in this era. We are now moving into a new era called the Imagination Era bringing with it changes that may help resolve the many negative issues our global society faces now. 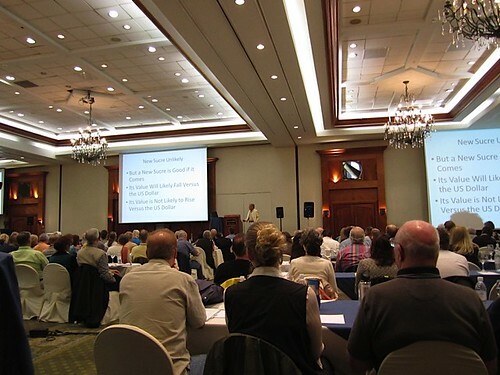 Each era greatly empowered massive new numbers of individuals, an empowerment that led to entire new classes. The working middle-class was born. This empowerment allowed the working class to rise from feudal subservient positions to positions of economic and hence political influence. Much of the world’s population became much richer, but these changes were accompanied by turmoil caused by periods when the old order had not let go and the new order had not taken hold. Many forces came into play and there were struggles for dominance to establish order. 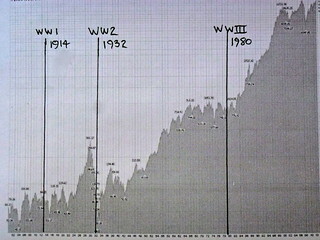 Forms of this turmoil were WWI, the massive economic recession of the 1930s, WWII and the Cold War. Wars and recession are signals that the economic-social structural order is breaking down, but that a new order has not yet taken control. Serious things go wrong. Such breakdowns lead to enormous conflicts that we call wars. Major wars accompany great social, political and industrial change and bring out the most competitive aspects of society. This speeds up change. The key is that the struggle is so intense and the stakes so high that all concepts of return on investment for research and development are thrown out the window. How can we know what’s next? 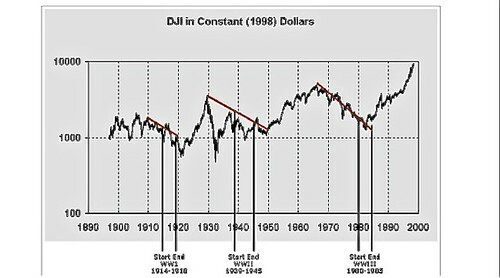 Cycles in the Dow at Stockcharts.com (see link below). These cycles are one part of a compass to global economics that can help each of us determine our unique path of living, earning and investing. This chart shows the relationship between a falling market… faltering economy and intense military struggles that create disruptive technology leading to increased productivity in mankind. The question we have been asking at our site for several years is… what will cause WWIV? This is one of many factors. 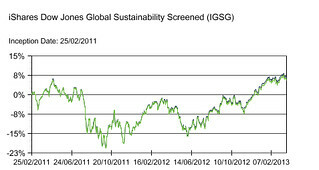 The Dow for example has decreased in importance as a global economic bellwether. The NASADAQ investments for example became increasingly important in the 1990 to 2000 dot.com climb. The US has also lost much importance in the global economy. Synchronicity between US and other markets need extra understanding now. However the charts below of the Dow Jones Industrial and Morgan Stanley MSCI World Index suggest there is still a very strong correlation. Dow Jones Industrial Index 2005 – 2013. 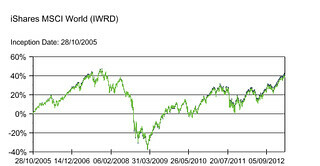 Morgan Stanley Capital Index World Index 2005 – 2103. Currency changes need to be accounted for. This mobile scenario is then overlaid by the never ending search for value. Most important the way every individual’s circumstances, wants, needs, desires and mission are the keys that fit a unique piece into this global puzzle. To sum up the global fundamentals, two gigantic forces struggle one against the other. 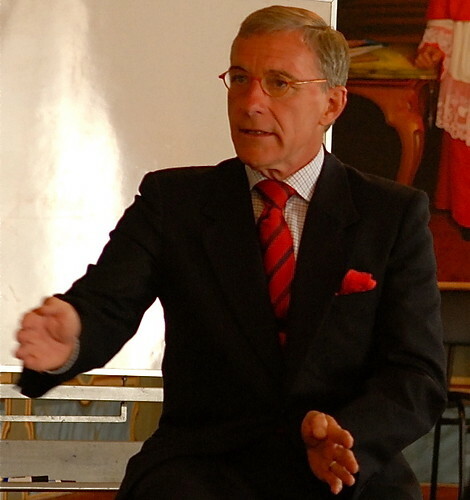 The positive forces include added efficiency from shifting into a computer driven industrial revolution, which is opening a global economy. Individuals are empowered to be more, be in more places, do more, make more and have more. The negative force is the resistance, congestion, and pollution to and from this change. Evolution takes place unequally and creates distortions. 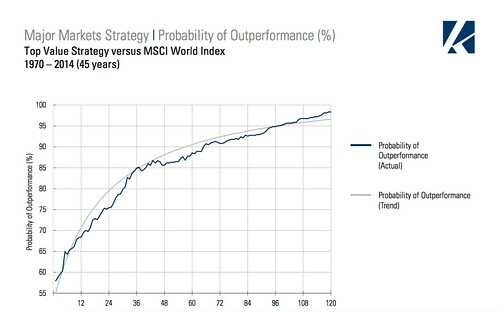 As these distortions grow, the risks of a correction global rise. The growing tensions are revealed in commerce and the rapidly changing art of war. Man has always run risk. Change brings risk. Today we face change taking place at a faster and faster pace. This means we run an increased risk. 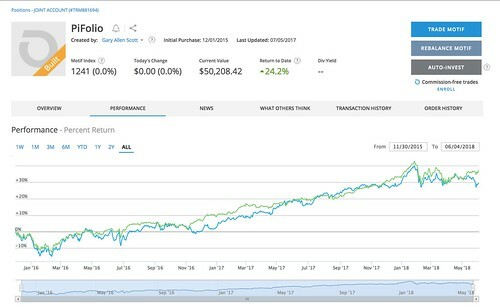 The fundamentals explained above help us see how to profit from running risk.